Alison and I are still working through the feelings related to putting Nunya to sleep in August. It has been over three months and we are still slowly removing her items. With this being my first pet loss experience, I really underestimated the impact the loss of a great pet can have. The hardest question/statement for me has been – “when are you getting a new dog” or “look I have this puppy, you need a new dog”. While I am realistic and know that she was a dog, she was my dog and is not so easily replaceable. I know the people asking have good intentions but it is always something that makes me pause and panic. Realistically, there will be no new “Nunya” for me. Nothing will fill that gap and if I try to find a replacement so fast – I will be doing exactly that, just finding a replacement. I will get a new dog when I am ready to create a relationship with the animal not based on the traits that I love about Nunya. I know the time will come eventually. We are still dedicated to our goal of getting the information we have into something useful for others who might be also be dealing with a pet with cancer. Most of our experience is specific to a nasal tumor in Nunya’s nose so we really hope to record other people’s experiences with other types of dog cancer. Our goal is to get up several sections on specific events / problems (for example, nose bleeds). Each section will have a little bit of what we experienced, what we learned to deal with it, and what questions we would ask having the advantage of hindsight. We are working on a timeline and hope to offer an itemized list of expenses related to each procedure or medication. We appreciate any feedback, positive or negative. My beloved Duke (Australian Shepard) was diagnosed with his nasal cancer on March 23rd. He is our life and we are slowly losing him. The size of the lesion had matasised into his brain and is pushing on his eye. It was that to which first alerted me as I know every inch of his 75 pound body. The bloody nose forced me to seek out help and in a matter of a month we sourced the true evil source. Duke is very smart and detest the vet. So much that we knew the radiation treatment option offered gave little back to any lasting quality of his life and he would suffer. No matter what path taken it is very hard to know what we and Duke were up against. We’ve tried our hardest to make every day Make a wish dreams happen. I have created art work with his paw prints and am in the process of posting a YouTube video to honor him. Which leads me to you and a question only someone that’s walked this road. Last night his breathing was rough. He is trying to breath from his nose, but the blockage forces him to get air in from his mouth. He crawled on the bed and I knew he was telling me ” hey I’m having a hard time” I kept rubbing his back and sweetly speaking to him. He sounded very congested as his mucus is not draining properly. It was the first night this urgency from him happened. He’s had weeks of noisy rattling snores and inverted sneezing. But my fear seems to be elevated that not being able to sleep for more then a for minutes along with the sounds of gasped air seems dire. When Nunya was facing this – what signs offered you guidance in knowing her time was running out? Thank you very much for sharing your story it has brought me much comfort and relatabilty to this horrific ambush of my beloved dog. I am so very sorry about Duke. It is such a hard thing to have to face and you just do the best you can given the circumstances. Duke is surrounded by his family and I know you are giving him comfort and love, which makes him very lucky. To answer your question, it is hard to know when it is time to let go. With Nunya, she went several months with congested breathing but seemed to cope ok. As long as we kept her calm she could sleep and seemed to manage fine. At the end though the tumor seemed to take off and grow quickly. Over the span of just a few days we could tell her breathing was very blocked off and she was struggling to get a good breath and really only could through her mouth. She would try to sleep but would be woken up after a few seconds trying to catch a breath. This was the sign for us that it was quickly getting worse and worse and she was uncomfortable and starting to suffer. That’s when we knew the call to let her go had to be made. It of course was such a painful call to make but we couldn’t let her suffer. 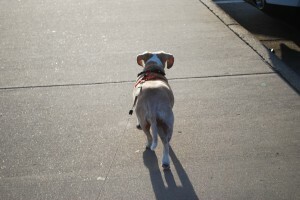 Vets have told us that when your dog no longer enjoys their regular activities and their quality of life has gone down that is one of the biggest signs to know it is time to let go. I don’t know if that helps at all, but please be assured you are doing the right thing and what is best for Duke. Best wishes to him and your family. Thank you so much for posting this. I am so sorry you ultimately lost your beautiful pup. It is amazing that you got so much bonus time with her though after radiation. Our dog was just diagnosed with an oral sarcoma and i am devastated and looking for answers/experiences. this was really helpful to me. I’m so sorry for your loss 🙁 Thank you for sharing your story. My beloved dog of 15 years was diagnosed with high-grade undifferentiated nasal sarcoma, and within two weeks, I made the difficult decision to help him transition. Like you, I underestimated the pain of this loss. Sharing your timeline has helped me because, I keep questioning my decision to set him free. My heart goes out to you and your family.